A few years ago a Texas couple in search of a desk attended an auction at a bank in Houston. The pair, who were Christian Scientists, looked over a large assortment of desks, but found nothing to their taste. The wife then walked over to a large glass case containing items from the bank’s vault, where a beautiful diamond brooch caught her eye. It was a miniature portrait of a woman, edged in forty diamonds. 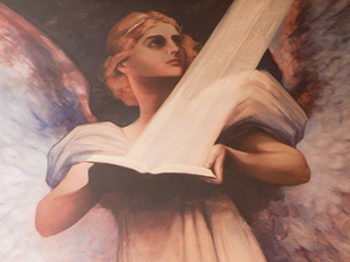 She recognized her immediately as Mary Baker Eddy, the Discoverer and Founder of Christian Science! The next day the couple bid on the pin, as did several jewelers interested in acquiring the diamonds — also two ladies who had no idea whose face was on the pin, they “just thought the pin was pretty”! The Christian Scientists won the final bid and happily took the precious pin home with them. After enjoying it for a few years, they generously donated it to Longyear Museum. 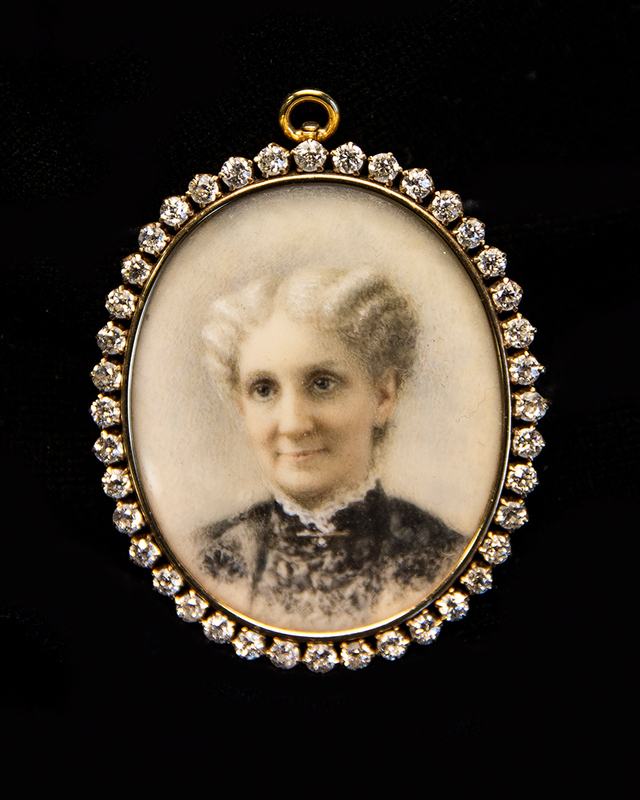 Longyear was especially pleased to accept the miniature portrait pin into its historic collection, as it is believed to be the one Mrs. Eddy gave to one of her students in 1898: Augusta Stetson. It could be said that this gift represented the high value Mrs. Eddy placed on this promising student. But the promise proved to be a sad disappointment, when Mrs. Stetson’s materialistic excesses and aberrant interpretation of Christian Science eventually led to her downfall and excommunication from the Church. 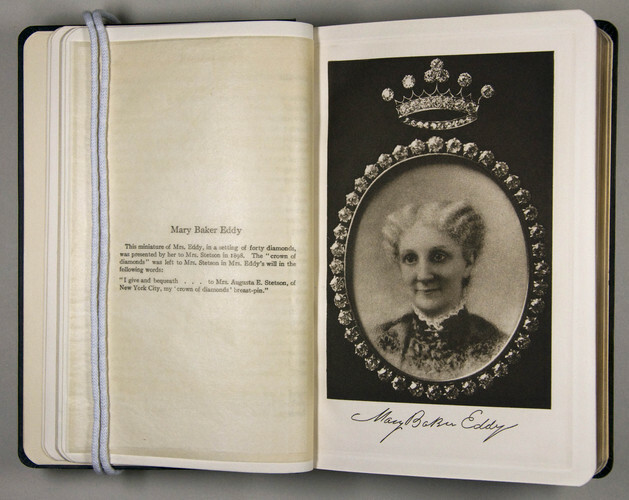 In his three-volume biography of Mary Baker Eddy, Robert Peel writes of their long and close association: “On no one did she [Mrs. Eddy] lavish more care and affection than on this brilliant, willful, ambitious woman whom, she explained, she loved for the incalculable good of which she [Mrs. Stetson] was capable” (Mary Baker Eddy: The Years of Trial, p. 177). 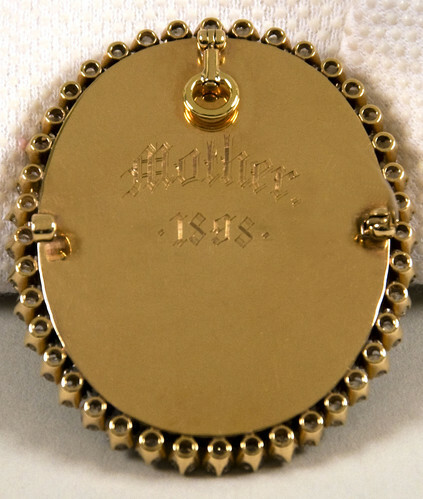 Although this was not the only image of herself or the only beautiful piece of jewelry that Mrs. Eddy gave to someone close to her, there are a number of clues that suggest that this pin was the very one she gave to Mrs. Stetson. One clue is a photograph of Mrs. Stetson wearing the pin, as well as the pin’s inclusion in her book Reminiscences, Sermons, and Correspondence 1884-1913 . The pin looks exactly like the one now in the Longyear collection. 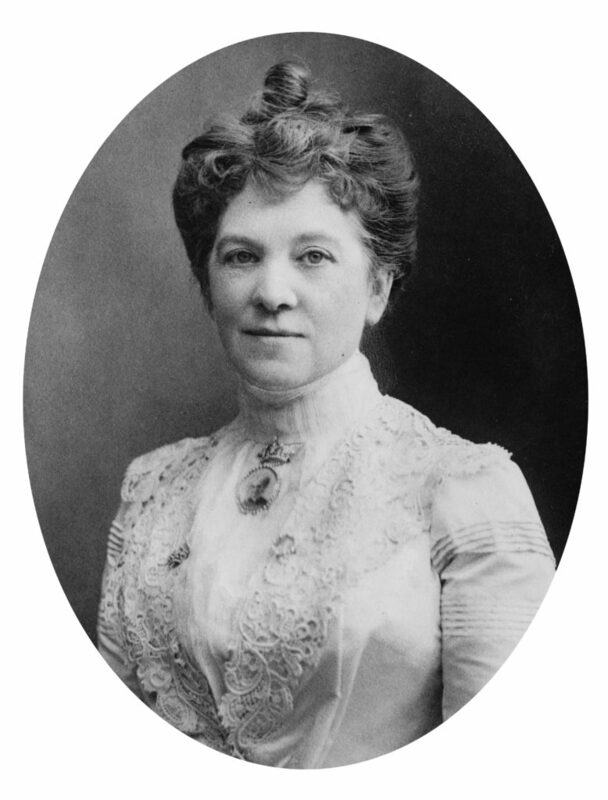 Mrs. Stetson wearing her gift in 1908. Courtesy Library of Congress. I, as a corporeal person, am not in your midst: I, as a dictator, arbiter, or ruler, am not present; but I, as a mother whose heart pulsates with every throb of theirs for the welfare of her children, am present, and rejoice with them that rejoice. It appears that the diamond-studded brooch Mrs. Eddy gave to Augusta Stetson in 1898 ended up in a bank sale in Houston. Fortunately, however, it was rescued by a pair of Christian Scientists and brought back to Boston, where it now resides in the Longyear Museum collection. Longyear Museum will be closed on the weekends from January – March.